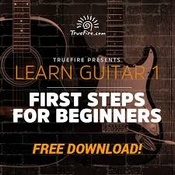 To help you find the Best Guitar Lessons, TopConsumerReviews.com provides you with an in-depth comparison of True Fire and Artist Works. Cost and feature set varies according to instrument, genre, and instructor. For most guitar lessons on Artist Works, the cost is $105 billed every 3 months, $179 billed every 6 months, and $279 billed every 12 months. With Artist Works, you can choose from multiple instruments (not just guitar) and then select a teacher to learn from according to the style or genre he or she offers. The price will mostly remain the same, but we did find one exception in pricing plan structure and cost for one guitar teacher. Once you sign up for a plan 3-month, 6 month, or 12-month plan, you can begin your lessons. You can schedule your learning any way you like. The way lessons work is that you follow a tutorial, record a video of your learning and practicing process, and upload it to the Artist Works website. Your instructor then views your video and responds with feedback, tips, and additional practice or techniques to try. Guitar teachers include award-winning professional artists who are proficient in rock, blues, country, jazz, dobro & lapsteel, bluegrass, and classical across instrument types such as electric, jazz, acoustic, blues, classical, country, and rock guitars. Each plan’s premium features include hundreds of lessons, a video exchange archive, video submissions to the teacher (5, 12, or unlimited), a music theory workshop, the AW Live monthly broadcast, and VIP bonus content. Artist Works guarantees that the platform is the most effective and instructive way to improve your skills online. However, Artist Works provides no refunds, credits, prorated reimbursements, or refund via chargeback disputes whatsoever. Membership can be renewed automatically and so if you’re unhappy with the lessons, you must cancel your subscription before it renews at the end of the current billing period. Compared to other online guitar lesson systems, Artist Works feels limited in number of guitar instructors (only 10 at this writing) and disconnected in its approach of recording and uploading a video for asynchronous instruction. For some people this may be the focus and feel that they want, but for those used to a more direct interaction with a tutor or teacher, the record-and-upload feature may be too limiting. Also, given that lesson sites and learning styles vary so widely, it is really a concern for a lot of students that the money they invest in starting a program be refundable if things don’t work out. Based on this critical factor alone, and the fact that Artist Works offers no refunds or money-back guarantees, we are recommending that you look elsewhere for a guitar lesson system.